It is winter in many parts of the world when it is simply too cold for drone pilots to fly outside. There are some people who will still head out and no matter the weather and fly their drones. However, there are circumstances simply too cold for our drones to fly. It is not recommended to fly outdoors below -5 °C (23°F) because of the mechanical components and batteries. While we all would like to have powerful top-quality drones like those from 3D Robotics, Yuneec and DJI, most of us will be using less costly radio-controlled multirotor drones around your backyard or living room for a couple of minutes at a time until you unavoidably disappear into the trees or hit the ground. Indoor drones are becoming increasingly popular as a way to have fun, make movies or take amazing indoor photos. 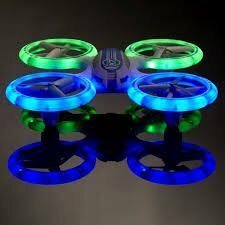 Because they are relatively inexpensive and very small, you can have a good time flying them without being concerned about watching something $500 or more get stuck in a tree or crash. These drones come with sophisticated navigation system on them and they are generally very stable, which makes it pretty simple to fly these drones indoors even when approaching walls or in confined spaces. 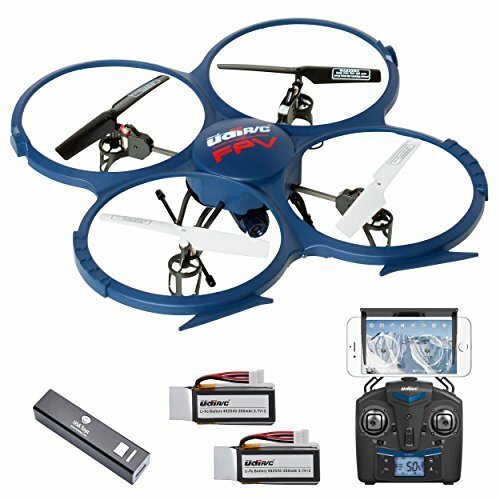 There are many drones to choose from to suit your budget and your needs. Bear in mind when you are shopping that flight times on toy drones are usually about 6-8 minutes, so you should go with a model that uses removable rechargeable batteries if you want to keep flying without charging first. Also, if you are a beginner pilot, it is recommended buying one that has replacement parts readily available. Inexpensive drones are still relatively new, and they are almost impossible to find even in hobby shops. However, you can find many models online. This article highlights the best drones for different purposes. Axis Drones specializes in manufacturing the smallest drones around. Its $45 Turbo-X is one of the fastest microdrones capable of 50 kph/ 30 mph speeds. It takes a lot of practice to fly such a fast and tiny drone because it is very responsive to even minimal stick commands. It may be difficult to learn to fly it at first and you will probably spend more time crashing than flying, but you shouldn’t worry about it because this drone is pretty tough. You will have around 6 minutes of flight time off a single charge. The battery isn’t removable and you will have to plug it in into a USB port for around 25 minutes to begin flying again. Also, the huge problem is that you can’t replace anything except propellers. You can take it out and fly it anywhere at anytime. However, this drone is not the best experience for beginner flyers because it takes patience and practice to fly well. If you are looking for a cheap drone to learn the control basics, the Hubsan X4 is an excellent place to start. It features a lightweight airframe with matchless durability. It comes almost ready to fly out of the box and it is availably with or without a camera built in. The prices start at just around $40. In the package you get the drone, a gaming-style controller, spare propellers, a USB charger and a single battery that lasts around 6-8 minutes. The X4 is stable enough and its tiny size allows you to undertake precision controlled missions indoors, including those confined spaces and small office cubicles. 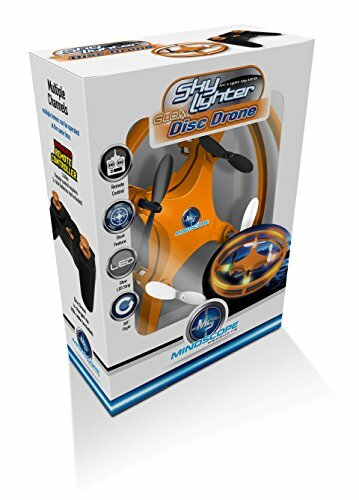 This drone features two flight modes that allow novices to learn the basics, whilst also providing an advanced mode that allows experienced flyers do flips and other complicated maneuvers. Its motors have enough power to fly outside and the latest version of the X4 H107L has two blue LED lights. These lights not only help in flying during night-time and dark spaces, but also add a cool, nice look to the drone. The X4 H107L is widely available and batteries and replacement parts are also easy to come by. Whether you are looking for an entertaining activity to enjoy indoors or just starting out as an RC hobbyist, this drone is perfect for you. This drone is recommended for taking a baby step into racing drones. It is also perfect for people who are looking for a fast minidrone to learn flying basics indoors and outdoors, but it is still fun for more experienced flyers. 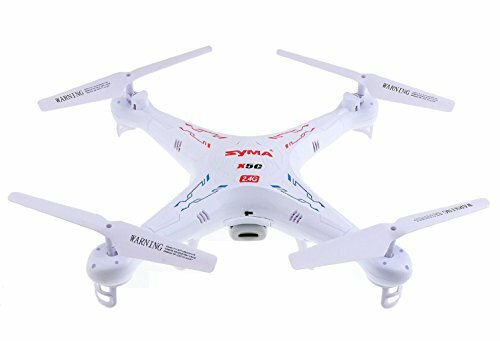 At about $50, the Syma X5C is one of the least expensive minidrones and it is particularly ideal for beginners. It comes with a 720p camera and a 4GB microSD card. Syma X5C feels a bit cheap and the camera is basically toy-quality, but it flies unexpectedly well and can handle a lot of crashing. It is able to create almost perfect continuous roll that allows for much better performance and action. This drone is simple to fly and comes with a variety of control options. It utilizes spread spectrum technology for remote distance control. Battery life comes in at around 8-10 minutes, but extra batteries and replacement parts are simple to come by. Syma X5C is a simple, ready-to-fly minidrone with a camera that flies better than its price implies. 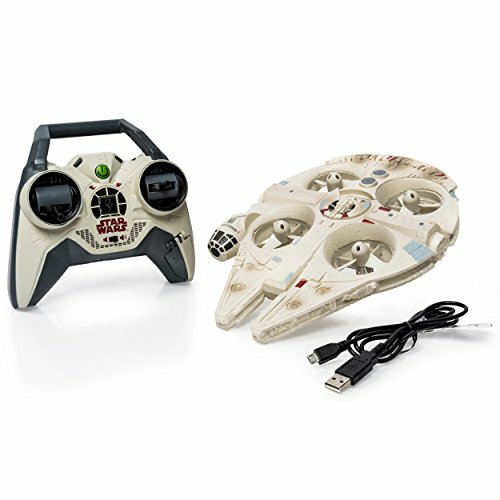 Now you can fly the most iconic ship in the Star Wars universe: the Millennium Falcon Quad with iconic LED lights and authentic sounds! The Millennium Falcon uses 4 rotors concealed on the body of the ship for agile, space-like flight! It is the most „toy“ of the drones here, but just as much fun to fly. The best thing is that , when you fly around, the controller will scream out sound effects. This drone is made from Styrofoam and its four propellers are completely protected on their sides. This makes for safe flights indoors. However, this drone can’t handle anything more than a slight breeze outside. Unfortunately, there is no simple way to remove the battery, so once the battery winds down after about 6 minutes of flight it takes around 60 minutes for it to completely charge up to 100%. It costs about $70 but you don’t get much for your money – only the drone, a USB charging cable and a controller. This drone is recommended for crash-prone indoor flyers. This drone is very simple to fly and soft enough not to do any damage to walls and furniture. It is a good fit for anyone who just wants a nice tiny drone to fly around the house. The X-7 Microlite’s design is what set it apart from other microdrones. It has tiny propellers which are protected from the bottom and sides by its body. Also, the rings around the propellers are lined with extra-bright LED lights. These lights can add some fun to flying at night and help you tell easily tell the direction your headed. Odyssey Toys X-7 Microlite is available for about $60. It is a stable flier indoors and outdoors, and with a button press and a flick of the right stick it will perform rolls and flips which look even cooler in the dark. 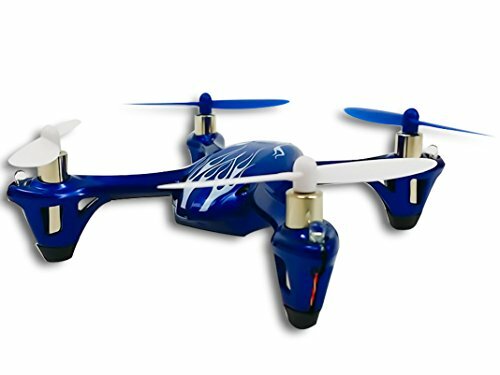 This is a beginner palm-sized drone for flying in the backyard or around the house, night or day. 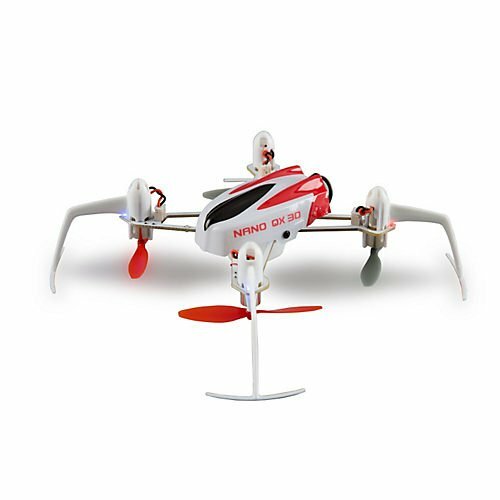 The Horizon Blade Nano QX is a tiny mini drone that is designed to allow you to enjoy flying fun anyplace, anytime and anywhere. Its amazing stability, tiny size and lightweight construction means that it can maneuver through even the smallest of indoor offices and rooms. Also, this super small indoor drone is an ideal option for beginner flyers. The proprietary SAFE technology system with agility and stability modes is one of the features that make this drone perfect for amateur pilots. This amazing technology lets the drone „auto-level“ itself whenever you are in trouble. So if you get into troubles while flying the drone, just let go of sticks and the drone will stabilize and come back to a hover by itself. The stability mode (low-rate) which is meant for amateur pilots gives you simpler control. However, you can always upgrade to agility mode to do amazing stunts once you gain enough experience. Its airframe features built-in blade guards and is both durable and flexible, while the strong brushed motors provide a sturdy and smooth lift. The Horizon Blade Nano QX is very reasonably priced, making it ideal for the interested novice looking for a capable and fun drone that is inexpensive. UDI U818A Quadcopter Drone is unquestionably one of the best indoor drones for filming available on the market today. This drone comes with some incredible features which can change the way you perform aerial filming indoors. These include high capacity battery and strong power motors that help the drone to fly more efficiently and longer, 6 Asis Gyroscope with posture control that allows for precise positioning of the drone, 4 Channel function that allows stable flaying and simple, safe, effortless operation, Video Camera First person view (FPV) and a modular design which make is pretty simple to install and repair. This drone is a perfect option for anyone who wants quality drone for filming but have a limited budget. So here you are, these are the best indoor drones that you can buy for yourself or as a present.